"Take me away from all of this death!" laments Winona Ryder in Bram Stoker's Dracula* (hilarious!) doing her best-worst impersonation of herself in the (intentionally comical) Beetlejuice. Sister, you said it! 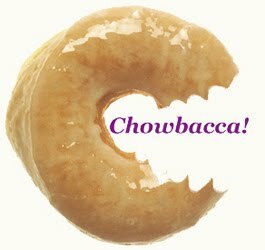 We at Chowbacca! are sick of people dying on us, so quit it! Call your loved ones today and tell them how much they mean to you. Go on, we'll wait. Sometimes life is not a bed of roses. Sometimes it just isn't fair. Sometimes your "Irreverent/Maudlin" switch is broken, stuck in maudlin. When the world seems dark and more confused than Keanu Reeves trying to do a British accent, there is comfort food. Every culture has comfort food, a lot of it is specifically for funerary purposes. The Jewish nosh. The Irish wake. The Amish and their many cakes. Soups, dumplings, pies aplenty. Though not specifically a pie of condolence, who isn't comforted by a steaming hot pot pie? And what, prithee, shows more love than rolling out pie dough from scratch, making your own filling and pulling perfect pot pie from the oven? For our purposes, I am adapting the "Smitten Kitchen" pie crust, which eschews modern conveniences such as food processors in favor of the old fashioned dough cutter. I don't have a dough cutter, so I used a set of metal whisks (one to do the rough-chop work, and a collapsable one to do the fine crushing). All pie recipes are very stern about one thing: keep your fat cold, your water cold and your flour cold - and never overwork the dough. Considering I could see my breath when I woke up, keeping everything cold was not a problem. 2 1/2 cups of all-purpose flour. 1/2 cup of cold half and half or milk. 2 sticks of cold butter, cut into small (1/3") cubes. Shake cubes of butter into flour in a large metal or ceramic bowl. Using a large metal balloon whisk, work cubes of butter into the flour and salt until mostly the texture of cat litter (can take up to 10 minutes, but remember, you're about to commit a "carb on carb" crime, so work it out). 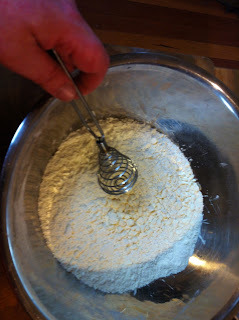 Using a collapsable "spring" whisk, work out the larger lumps. Slowly pour in liquid while gently folding with a large spatula until large clumps form. 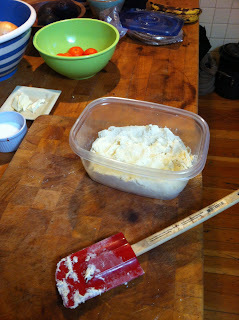 Turn out and gently knead until a large ball forms, set aside, covered, and chill for several hours. 1 cup (8oz) of Beer. 1 cup (8oz) of chicken stock or broth (if you have to get it out of a can, skip it, just add milk or beer). 1 cup half and half or milk. Melt butter over medium heat in a saucier. Add flour and cook flour for 5-6 minutes in butter to form a roux. Add liquid and stir until smooth and the thickness of heavy cream. Mixture will thicken as it cools, so keep warm or reheat before using. 1/2 chicken, poached in stock or milk, cut into 1/2" cubes. 4-5 small fingerling potatoes, cooked and cut into 1/2" cubes. 5-6 peeled, blanched carrots, cut into 1/2" pieces. 2 cups of crimini mushrooms, quartered and dry sautéed until brown. 1 large yellow onion, 1/2" dice, sweated. 1 tablespoon thyme leaves, crushed. 1 tablespoon sage leaves, chopped. Roll out dough and arrange into two pie tins or pie plates (preferably on a double-thick cookie sheet - one that will not warp in the oven). Reserve some dough for topping. Heat up béchamel and stir in remaining ingredients. Thin slightly with milk or beer as needed. Should be the consistency of a creamy soup. Ladle hot mixture into pie tins about 1/3-1/4" shy of the top. Place measured disc atop pie and crimp edges, using a knife to trim any excess. Paint top with milk using a pastry brush. Sprinkle with dill if you want. Vent pie with four 2" slices, evenly spaced. Bake for about an hour or until crust is golden brown and filling is bubbly. Let cool for at least 30 minutes before even attempting to eat, you savage. In case you missed this the first time - click the links! Hilarity ensues! That works too... I just happened to be making chicken stock so I used that to pre-boil the veg.